I've been using Dove bar soap for years now (it's the best on my sensitive skin! ), but I have yet to try any of their other products. Until now. Being pregnant my hair has been dryer than usual, so I'm on the lookout for an affordable conditioner that will moisturize without weighing my hair down or making it greasy. 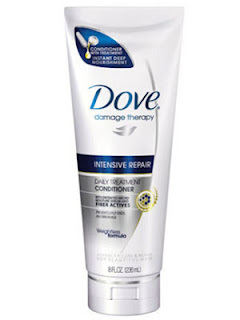 So when I got asked to do a completely honest review of Dove Damage Therapy Intensive Repair I responded with an immediate "YES!". The way Dove conditioner works is that it's suppose to restore surface damage on your hair while also restoring damage inside the hair follicle as well. Sounds like a pretty good treatment for dry strands if I do say so myself. Scent: Light and fresh. Not flowery or fruity, but a good light clean scent. I don't want to smell like an apple blossom passion fruit explosion so 5 stars on scent for me! Ease of use: Could not be easier. The bottle is very easy to dispense from. I like the way the bottle stands, with the opening on the bottom of the bottle. That way I don't have to shake the bottle like a mad woman to squeeze out the conditioner. Anyone know what I'm talking about- that moment you realize you look rather comical as you stand there violently shaking a conditioner bottle to get it to dispense? 5 stars on ease of use for me. Results: Dove promises that their conditioner will give you the end benefits of "smoothness, softness, shine and frizz control with no surface greasiness." I don't think I could describe my experienced end benefit with Dove's Damage Therapy Intensive Repair Conditioner much better. 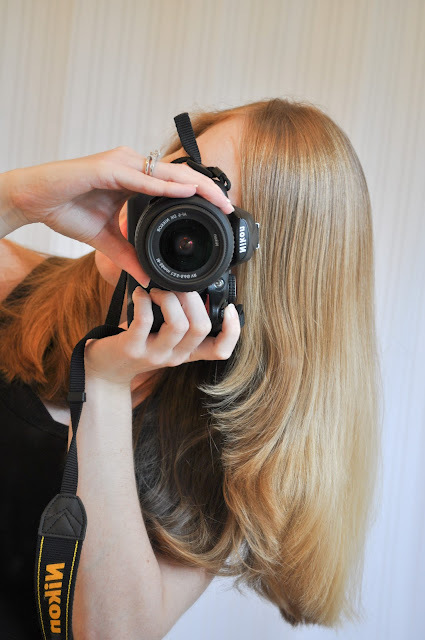 I was pleased with the smoothness, softness, and shine it added to my hair. Plus my favorite outcome: no surface greasiness! And, I might add my hair tends towards the very static side of things and this conditioner did not make my hair static one bit! In fact, I think it fixed my hair of it's static tendencies. I will definitely continue using Dove hair care products in the future. And I have no other product in my hair. Just used the Dove conditioner after shampoo, and once my hair was dry brushed it. What Dove products have you tried? And don't forget to check out the giveaway below, you could win a $1,000 Spafinder giftcard. That'd make any girl happy! !